I’ve been making Apple, Feta and Spiced Pecan Salad with Poppyseed Dressing for years and it never, ever disappoints! 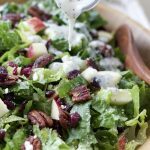 The ingredients in this salad are found in most grocery stores and the combination of fruit, feta and greens in this salad along with candied spiced pecans is an anytime of the year favorite in our home. This salad is easy to put together and filled with ingredients everyone loves. It’s destined to become a family favorite! I love to take this salad to gatherings where there will be a variety of salads because it’s not a common salad combination. Give me fruit, greens and sweet nuts and I’m one happy camper! The dressing on this salad is store bought, but you can also make your own salad dressing if you’d like. I love this version of homemade poppyseed dressing! My friend Kristen, husband Dave, and their 5 kids lived in Japan for a few years. While living there, Apple, Feta and Spiced Pecan Salad with Poppyseed Dressing was one salad they could always enjoy, even overseas. Kristen loaded the dressing, Craisins and pecans into her checked suitcase when she came home to visit family in the States. Back in Tokyo, she could always find apples, Feta cheese and Romaine lettuce at the grocery store. Imagine the looks when her bag was inspected in security… No drugs, but what the heck is this woman doing with all of these Craisins, pecans and salad dressing? The spices on the pecans are what set this salad apart from a hundred other “fruit, nut, cheese and greens” type of salads. When you toss the sweetened pecans, coated with nutmeg, cloves and cinnamon into the salad – Oh my. The spices combine with the dressing and salad ingredients for a unique flavor. Whenever I serve this salad, people ask me what is in the dressing? It’s not the dressing that is so spectacular, but the combination of the spices from the nuts, mixed with the dressing, which coats the leaves of the lettuce when tossed that give this salad such unique flavors! I love Brianne’s Poppy Seed Dressing on Apple, Feta and Spiced Pecan Salad. When Kristen shared this recipe with me years ago, she used Girard’s Champagne Dressing it is not quite as sweet as Brianna’s Poppyseed. I prefer Brianne’s or making my own poppyseed dressing at home. It’s a great salad either way. If you are looking for a main dish salad, top this with a bit of grilled chicken, sliced. Perfect summer meal! Line a baking sheet with foil. Spread pecans on baking sheet in a single layer, drizzle with melted butter. Sprinkle all spices and sugar on top. Bake at 350 degrees for about 5-7 minutes,or until fragrant and lightly browned. Toss pecans so all are coated with spice mixture. Set aside to cool. Wash lettuce, dry or spin thoroughly, chop, place in serving bowl. Top lettuce with apples, Craisins, crumbled feta cheese and cooled pecans. Drizzle dressing on salad, toss and serve immediately. -If using Costco Romaine lettuce, use 2-3 heads (they're kind of small). Approx 12-15 cups of lettuce total. I prefer to use romaine from the grocery store, the darker color adds visual appeal to the salad. -Make sure the apples are chilled. If you try to use apples that are warm, they will immediately brown after chopping. You may also dip the apples into a bowl of cold water, about 4 cups cold water to 1/4 cup lemon juice. Drain well before adding to salad.-I prefer to use Honey Crisp or Fuji apples. They are firm and don't brown as easily as Gala's or Red Delicious.-Make sure to bake the pecans on regular bake, NOT convection bake. I like to toss the pecans about half way through cooking. I also often cook the pecans on the stovetop over medium high heat in a teflon pan. Cook just until the sugar begins to caremelize, remove from heat and add the spices. Pour onto a sheet of foil and let cool before adding to salad. When you candy the pecans on the stovetop, when do you use the butter? If you candy the pecans in a saucepan rather than a baking sheet; melt the butter in the pan, then add the sugar, nuts and spices. If you love candied pecans, try my Pear and Pecan Salad with Vinaigrette. You’ll love that too. If you candy the the peans in a saucepan rather than a baking sheet, you can melt the butter in the pan, then add the sugar and spices. I know you’ll love this recipe!